Our BPA Free 16 oz. 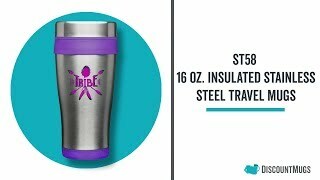 personalized stainless steel travel mugs are exceptional promotional products available in a number of color accents that include black, blue, red, orange, green, purple, pink, yellow and lime green. These feature stainless steel silver outer walls and insulated inner plastic liner, a smooth curved body for an easy grip, and spill proof plastic lids with slide lock. A great addition to coffee shops and stores everywhere, these can be printed or engraved with your logo design, brand name or special message to be sold as part of retail merchandise. Shop our insulated travel mugs printed or engraved according to your needs, and place your order in time for your event to qualify for our Free Shipping offer. Great product at a great price - and delivered very quickly! Thank you! We were VERY happy with our cups and the customer service we received from Toure McFarlanev!! Absolutely loved these mugs.nI had them done for my employees with our company values listed. Great job! If I had it to do again, I would've increased the font, but my error.nThank you. Excellent customer service with a speedy turn around time from initial order to delivery.